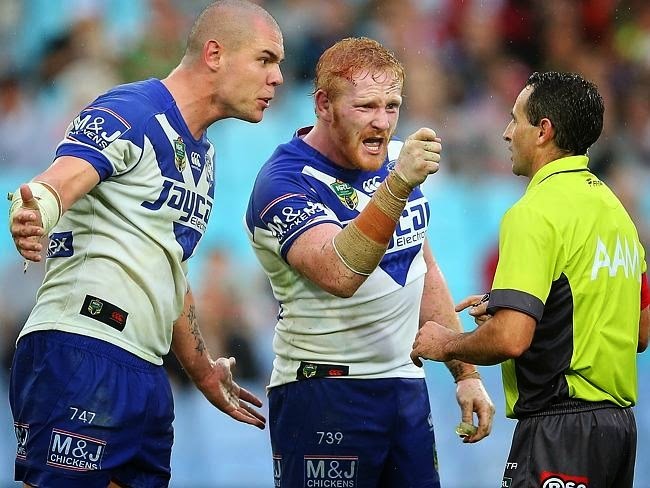 Bulldogs captain James Graham : ' It’s obviously not good behaviour, but I don’t know what the rules are." Home » Rugby league » Bulldogs captain James Graham : ' It’s obviously not good behaviour, but I don’t know what the rules are." Bulldogs captain James Graham has apologised for his aggressive confrontation with NRL referee Gerrard Sutton during his side's highly charged one point loss to Souths on Friday night. And the Canterbury enforcer has admitted he didn't know what the rules were regarding the match-sealing penalty he gave away after taking out Rabbitohs halfback Adam Reynolds when he tried to charge-down a field goal. Graham had an ugly spat with Sutton after becoming angered over the crucial penalty in which he collided with Reynolds leg and inflicted a serious knee injury on the Rabbitohs star. Bulldogs fans reacted with furore to the decision pelting match officials with bottles at fulltime in scenes that have been condemned by the NRL. And while some blamed Graham's outburst for fueling the crowd reaction, the Canterbury skipper was adamant he was not to blame. However, he has apologised for his approach to Sutton, while conceding he was unaware of the rules that led to the penalty. "I’m at marker, I get the sense they’re going to have a shot at field goal to make it 17-a-piece and I’ve just gone to put pressure on him and I’ve dove at the ball," Graham told News Limited. "It’s embarrassing for me to admit, but I don’t know what the rules are." Graham admitted it was wrong to question Sutton's decision and denied he swore at the whistleblower. "Stakes are high, emotions are high and that’s not an excuse for questioning the referees decision because really, he’s not going to change his mind," he said. "He’s made the decision and that’s final and we all know that, but even when you feel there’s a wrong and the game is close, it doesn’t excuse harassing the referees at the end. "It’s obviously not good behaviour, its not a good look. "It goes against everything a rugby league player is taught - that the referee’s decision is final and you respect the decision whether you believe its right or wrong." Graham said he had no intention of hurting Reynolds, who faces up to five months on the sidelines after sustaining a serious knee injury when the Canterbury captain collided with his leg. "I’ve just purely and utterly gone to get some contact on the ball to try and ricochet it and basically make it not go over the posts," he said. "I haven’t seen the replays, but I think anyone that watches it can genuinely see that I’ve gone for the ball. "I have not in anyway shape or form, gone to attack his legs. I’ve gone to attack the ball. "Obviously it’s not good (that Reynolds is injured). I don’t like people seeing get injured in any time in the game, but as I said there was no intent to cause any damage."